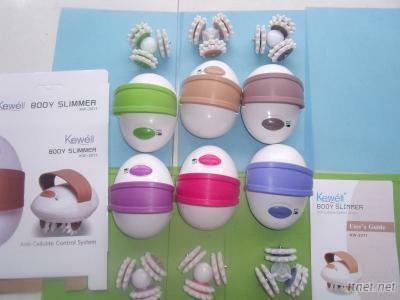 antiwrinkle, muscle tiredness and twist, fatness etc. 1, the ergonomics of handle design, especially for body using. 2, 1MHz ultrasound massager can enhance body care products penetrated into your skin surface up to 50~60mm. 4, the effect is better than hand massage or other massage devices. 5, It is safe for all ages and safe for daily use. 6, If any requires, please contact us without hesitation, your inquiry will receive our high attention and immediately reply. 2. Strong while soft enoug silicon teeth shape rollers, deeply grasp your muscle and rotate at very high frequency to break fat tissues underneath. 3. Soft hand-belt provides comfortable usage. 4. Durable design and high quality materials provide reliable quality, over 200 hours running test, to protect and build your high brand image. 5. Universal charger, fit for worldwide usage, covering 100-240V, 50-60Hz. Health & Medical, Health Care Products, Health Care Products/n.e.s.